Dystopian timelines are a staple of the X-books. Partly it's because the original "Days of Future Past" story was so well-received, but these stories also fit thematically. If there's any group of characters where Murphy's Law will kick them in their collective rears, it's the X-Men. 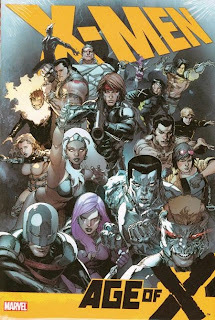 Some work better than others; for instance, Age of Apocalypse succeeded on an epic scale, while Bishop's future was so generic that it never really got its own timeline name. The X-Men: Age of X event, while smaller in scale than Apocalypse, is definitely in the win column, thanks to both Mike Carey's world-building and a mystery leading up to a clever twist. That it's only six issues long, plus three tie-ins, is a show of restraint; Apocalypse is long enough to fill two omnibuses. Big spoilers lie ahead; if you don't want the twist ruined, click away now. The story begins with Age of X: Alpha, an anthology following four major mutants: Cyclops, Cannonball, Wolverine, and Magneto. This is actually a bit of misdirection; only the last story is really key to the plot. That's not to say that Alpha is a waste of time: Cyclops gets a terrifying new origin as the Basilisk while Wolverine sacrifices his healing factor to stop the creation of the mutant cure. Only the Cannonball and Husk story seems extraneous; it's mainly there because the two titles crossing over were X-Men Legacy and New Mutants and at least one New Mutant needed to be in the lead-in. Magneto's story ends with a scene similar to the climax of the "Days of Future Past" film but in a larger scale as he abducts New York skyscrapers to build a fortress of refuge for mutantkind. We pick up three years later as humans and mutants are at a stalemate: the humans attack Fortress X, and the mutants defend it with overlapping psychic and physical shields. Magneto is growing impatient, Legion is a constantly-shirtless hero, Rogue has become the memory-absorbing "Legacy" and the Fortress' most feared fighters are what we would call the New Mutants. The appearance of Kitty Pryde and a camera full of hazy pictures of the outside world bring chaos into an already untenable situation. Legacy's investigation into the mystery puts her at odds with "X," the mysterious force that controls the Fortress, until she finally finds a man in the brig whom she doesn't recognize: Charles Xavier. One reason why Age of X is so enjoyable is because it keeps a brisk pace, using the introduction of various characters to also set up the central mystery. Suddenly seeing people like Moira MacTaggert alive again keeps the reader occupied; it's not even clear that there is a secret behind the story until the very end of the second part. Once that's in place, the threads start to unravel as Xavier regains consciousness, Legacy finds more evidence of how strange their world is, and X tries to stop them in their tracks by manipulating others. The truth finally comes out: Moira's responsible! Except that it's not really Moira . . . it's a facet of Legion's personality that's taken her shape. It's yet another story where Legion is at the core, but while it was a little incongruous in Fall of the New Mutants, it's built up to better over the course of this book. Carey also makes sure to explain what the stakes are and exactly what's happened to the world. Essentially, Legion has separated Utopia Island from the rest of the world and created a false reality wherein he is the hero he always wanted to be. This has been foreshadowed with his shirtlessness and people name-dropping him in otherwise unrelated conversations. Legion can warp reality to a massive scale . . . but he's not great at details. That's why Kitty Pryde could escape and why Xavier still exists in the Age of X timeline. The manipulation also has consequences; when reality returns to normal, everyone still has their memories. This means that the former supervillain Frenzy still remembers being married to Scott Summers, potentially throwing a wrench into the Cyclops/Emma Frost relationship. Others have further changes: Chamber, formerly of Generation X, regains his old combustion powers at the expense of his rebuilt chest and face. This isn't an event that can be written off and forgotten as "just a dream." This kind of ending also doesn't deflate the story; even classics like "Days of Future Past" can feel a bit hollow once the story is resolved. A recent Uncanny X-Men solicitation hints at something going wrong in Cyclops' mind; it might very well be the return of the Basilisk persona. Rounding out the Age of X trade are the two "Universe" issues which really should have been put towards the front. They show what happened to the Avengers, Spider-Man, and Doctor Strange in this timeline. By the time you read the stories here, the twist has been revealed, so it becomes a little unclear about how much of these stories actually happened. They technically take place in Legion's head as the backstory for his own little fan-fiction universe . . . except that they also feature a few mutants. While the Avengers tale is quite sadistic and the Doctor Strange/Dazzler story is just dull, Jim McCann and Paul Davidson's Spider-Man story is one of the event's highlights. Hunted for being too similar to a mutant, Spidey sacrifices his life to save the woman he loves . . . a pregnant Mary-Jane Watson. It's as if McCann wrote the story as a big "up yours" to Joe Quesada's treatment of the character. Despite this odd ending, X-Men: Age of X really succeeds as both a major X-Men story and as a narrative in its own right. Next week, it's back to GI Joe to simultaneously celebrate the Fourth of July and kick off the second annual Indie-Pendence Month.